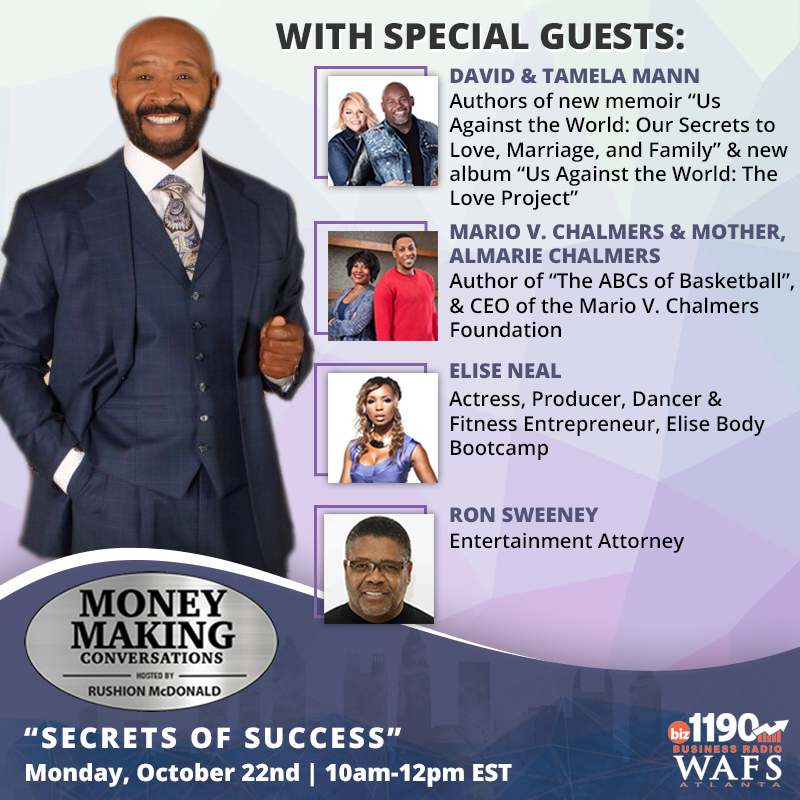 Appearing on this episode of Money Making Conversations is David and Tamela Mann, “Us Against the World” – Mann Family Tour; Mario V Chalmers and his Mother Almarie Chalmers – author of “The ABC’s of Basketball” and CEO of the Mario V Chalmers Foundation; Elise Neal – Actress, Producer, Dancer and Fitness Entrepreneur and Ron Sweeney – Entertainment Attorney. Each Money Making Conversations show hosted by Rushion McDonald is about entrepreneurship and entertainment. We provide the consumer and business owner access to Celebrities, CEOs, Entrepreneurs and Industry Decision Makers. They, in turn, deliver information about career planning, motivation, financial literacy and how they lead a balanced life. Don’t miss Money Making Conversations with host Rushion McDonald streaming LIVE every Monday at 10AM-12PM EST on biz1190 (www.biz1190.com), on our Facebook fanpage at Facebook.com/MoneyMakingConversations, anytime through our iHeartRadio Podcast, which can be found under the Business/Finance Section, Fridays at 10AM ET on SiriusXM Channel 141: H.U.R. Voices and Fridays at 7PM ET on SiriusXM Channel 142: HBCU. We want to keep you Winning with your Career and your Life! NextMoney Making Conversations: Bill Duke, Jonnetta Patton & Kindu Walker, Rickey Smiley, Mediaprince, and Kevin Powell.